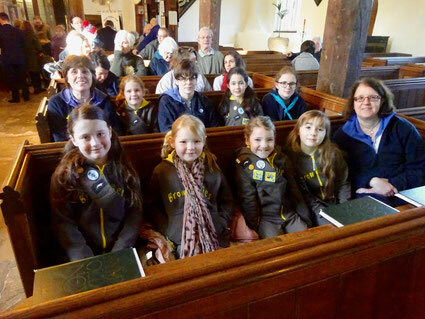 The Brownies and Rainbows have been involved in our services for a number of years. Their presence is always welcome. They hold meetings and have events all year. To give you an idea of the types of events and activities they do we have detailed their annual newsletter below. We get together with friends (from a variety of schools in this area) at regular meetings where we learn new hobbies, sing, explore other cultures and have outdoor adventures with a few badges along the way! We love to go along to camps, holidays, day trips and sleepovers. To give you a flavour of what we have been getting up to we have listed some of these activities and adventures below. If you would like to come along and join us then, please contact Brown Owl to find out how. 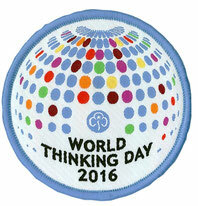 Monday 22nd February was World Thinking Day. It is a day of friendship, advocacy and fundraising for 10 million Girlguides and Girl Scouts around the world. For our celebration of World Thinking Day we joined a District Thinking Day campfire at Chigwell Row with the other Rainbow, Brownie and Guide Units in this area. During this year we have worked on our Road safety badge, Out and About and booklover badges and enjoyed a very muddy walk through the Gernon Bushes Nature Reserve! A visit to Tesco Church Langley as part of their Eat Happy project was a popular outing. We tasted fruit and veg and learnt about how much sugar is found in our daily food. Our Pack Holiday at Chigwell Row this year was ‘Four Seasons’ themed … we arrived in Spring journeyed through summer and Autumn and finished the holiday with Christmas (complete with a Christmas tree & Christmas stockings! ).There was time for crafts, cooking games, singing, climbing, a bunny hunt and so much more. A Birthday party for the Queen ! 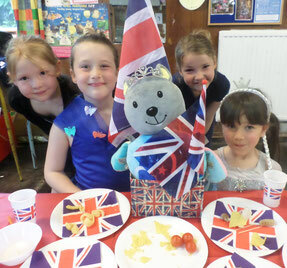 The Brownies had a super ‘Jelly Baby Challenge’ sleepover (which included some sleep). 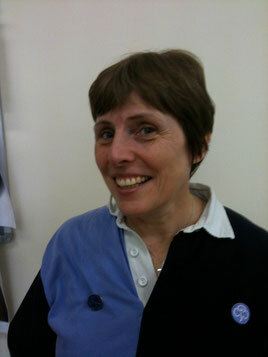 Science Badge Day Challenge Day. The day was filled with science themed fun & games, magnets, bubbles and lemon juice ! In June we had a meeting at a smallholding where we met a very inquisitive turkey, chickens, ducks, sheep, and ponies and learnt about caring for them. Watch out for the cream!!! 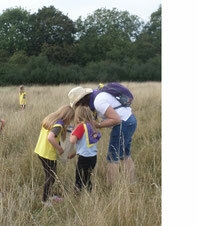 Make a Noise Brownie Day at Chigwell Row was a sunny, fabulous fun packed activity day. 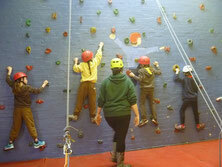 Brownies had the opportunity to climb the wall, zorb around the pool, shoot an archery arrow or a cork gun, bounce on a bouncy castle or pedal a go kart as well as many arts and crafts. We joined in with the church Flower Festival (we made The Secret Garden) & Harvest Festival service, reading prayers and having fun with squirty cream! Apple day at Copped Hall was an adventure. 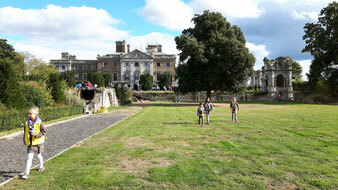 Beautiful historic house and grounds with so much going on for us to see and do. The Roald Dahl Challenge Badge is what we are working on at present, meetings filled with strange games, chocolate tasting and dreamcatcher making!